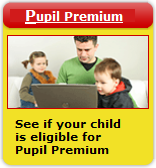 The pupil premium is an additional sum of money from the Government for the children of parents who meet the eligibility criteria below. However the school will only receive this money to improve your child's education if you claim it. - specialist resources or any combination of the above. From September all key stage one children are entitled to free school meals. Additionally eligible children in key stage two will also be entitled to free school meals. * Parents who are made redundant or start working less than 16 hours per week, may be eligible.